Is this alleged Cobb signature real? PSA and John Reznikoff think so. But why is it signed on a Conlon photo of Hack Simmons? Last summer AutographNewsLive.com pointed out that PSA had apparently authenticated a Ty Cobb autograph on what was purported to have been a photograph of the “Georgia Peach”, but was actually a classic Charles Conlon image of Cobb’s teammate Hack Simmons in 1910. 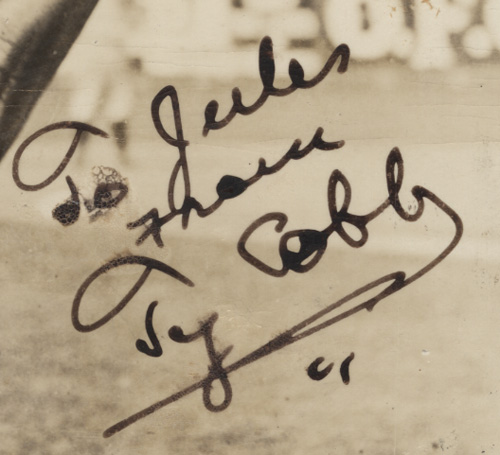 How could Cobb have signed a Charles Conlon photo of another player? He wouldn’t have. 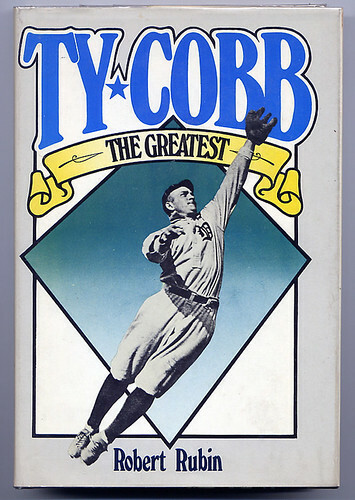 The photograph was signed in the hand of someone other than Ty Cobb. The signature resembles a host of other moderately skilled Cobb forgeries that have hit the market and are regularly authenticated by both PSA and JSA. Both companies have previously made egregious errors on Cobb items ranging from laser-printed forgeries to fakes executed on items manufactured after Cobb’s death. Many collectors and dealers who have witnessed these monumental errors have questioned how the 3rd Party Authenticators can offer their services as experts for a fee if they can’t even recognize Cobb’s genuine handwriting against a myriad of forgeries. Now, reader and boxing autograph expert, Travis Roste, has pointed out another Hack Simmons Conlon photo allegedly signed by Cobb that was sold at auction in 2010 for $4,500 and was authenticated by both PSA and James Spence Authentication (JSA). The photo, sold by Legendary Auctions, was described as “Graded Mint 9 by PSA/DNA” and noted in the lot description that it may have been “Cobb’s own idea to jump high” in the posed photograph. The photograph is clearly not of Cobb and is correctly identified as Hack Simmons on The Conlon Collection website as photo #PR08010. 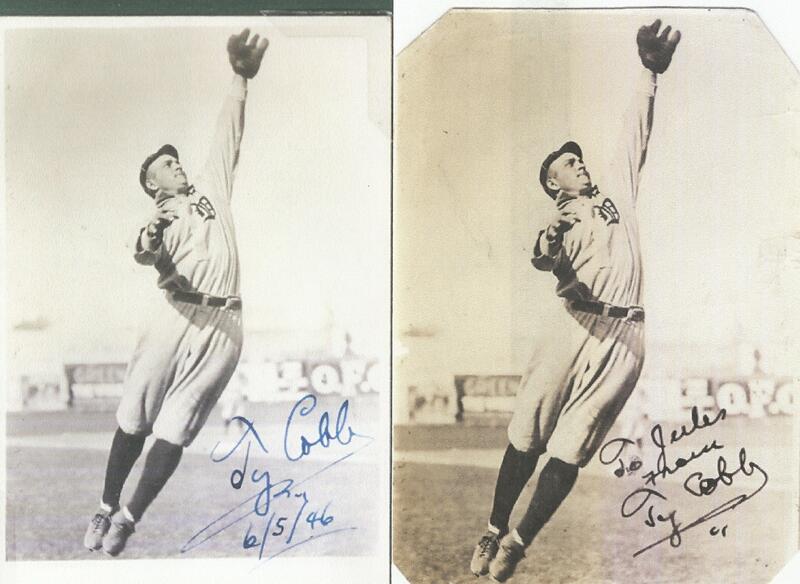 These Cobb forgeries were executed on classic Conlon photos of Detroit Tiger Hack Simmons. The example at the left sold for $4,600 at Legendary in 2010 and the example at the right is currently being offered for sale by PSA and JSA authenticator John Reznikoff for $3,600. Roste also informed us that despite the report last Summer pointing out the discrepancy over the Hack Simmons photo and the bogus Ty Cobb autograph, that same example is currently being offered for sale by PSA and JSA authenticator John Reznikoff on his University Archives website for $3,600. 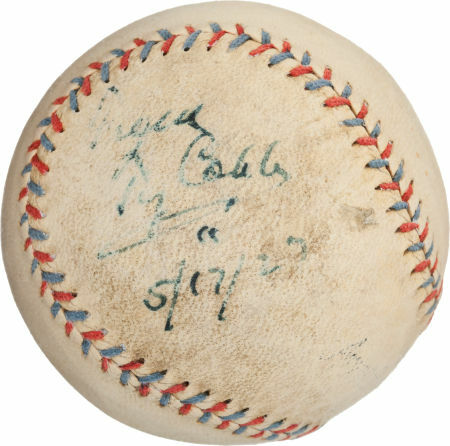 This alleged signed Cobb ball certified as authentic by JSA and PSA bears a striking resemblance to the Cobb forgery executed on one of the "Hack" Simmons photographs. This stunning example of shoddy research and authentication malpractice linked to alleged Cobb signatures joins others made on materials alleged to have been signed by Babe Ruth, Lou Gehrig, Christy Mathewson and virtually every other Baseball Hall of Famer. Close inspection of other Cobb-certified items by PSA and JSA will likely uncover other forgeries executed in the same hands as the “Hack” Simmons photographs. 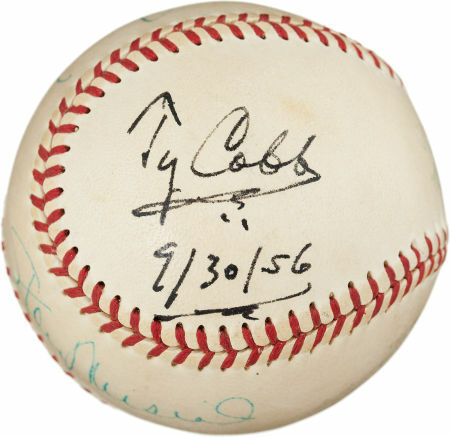 With just one Google search we were able to find at least one highly questionable signed Cobb ball sold by Heritage Auction Galleries in 2011 that bears a strong similarity to the Cobb signature on the 2010 Legendary offering. This Cobb forgery sold at a Detroit-area auction is in the same class as the PSA & JSA "Hack" Simmons forgeries. 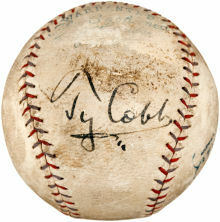 The forged Cobb signature was placed on a ball manufactured after Cobb's death. Cobb forgeries have infiltrated the market on a grand scale in the past several years and many have been certified genuine by the likes of authenticators Justin Priddy, Chris Morales and Drew Max. Those examples, for the most part, rarely make their way into the big-time auction house sales. However, it appears that outfits like JSA and PSA have also authenticated highly questionable Cobb items ( like the “Hack” Simmons photos and many others) which have been legitimized in major auctions but are in the same class of Cobb fakes as one that sold recently at an auction in the Detroit area. That alleged Cobb-signed ball was misrepresented as having once been part of the Ernie Harwell collection. 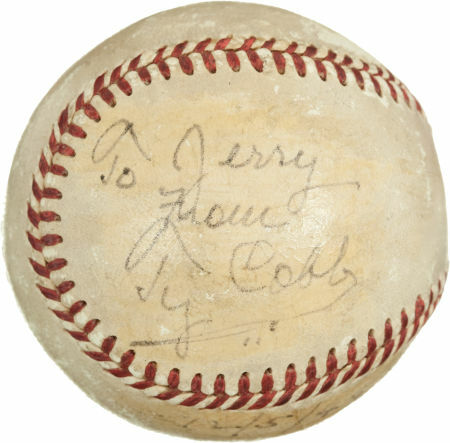 The Detroit News reported that the ball sold for $12,000 but it included a forged Cobb signature on a ball that was manufactured after Cobb’s death. The ball itself also appears to be a forgery of an Official American League William Harridge ball. Sources indicate that the FBI is aware of the serious problems with both JSA and PSA’s track record of authenticating Cobb forgeries. However, one other source, who was recently victimized purchasing over $10,000 in forgeries, told us that the FBI indicated they could not take their case because the dollar amount of the transaction was not substantial enough. All three baseballs being offered by Heritage have been authenticated by either PSA or JSA, but none of the experts we consulted with would give an opinion stating that they were genuine. We’d like to hear what our readers think of this trio? Thanks, Peter. Your investigations are always helpful and extremely disconcerting. Why the FBI will not get involved is crazy….it should be demanded….with all the damage these scam artist have caused good people as a collective whole DOES make it substantial enough! It all goes on and on ,in a never ending saga of bogus items that John Q has paid through the nose for,SICKENING. Great Work! It is disgusting that these so-called Authenticators aren’t prosecuted for fraud based on these track records. Thank you for exposing what they really are. Education, homework, and research are the only ways to get an autograph you don’t physically get yourself. Thank you for these alerts..They are Great!!!! As businessman I’ve had the pleasure of purchasing autographed 8 x 10 photographs of famous athletes like Bill Walton and the famous Hollywood director Quentin Tarantino as gifts for people who I’ve worked with. Even these days the idea of buying a forged piece of merchandise is maddening. As long as collectors are willing to pay thousands of dollars for something so ephemeral and subject to interpretation as an autograph, there will be be “good” auction houses and “good” authenticators who, swayed by the possibility of enormous profit, make “mistakes.” It’s human nature, not always a conscious intent to deceive. If collectors factor this into the prices they are willing to pay, the market might actually correct to a level where “mistakes” are less likely to show up at auction with bids starting at four, five or six figures. Maybe it’s just wishful thinking on my part, but that’s how financial markets generally work, though of course they are still vulnerable to manipulation as well. Where are people getting the baseballs from to make these fakes? I have autographed baseballs from the 1980s that have sat in ball holders, in a temperature-controlled bedroom, that have not aged as well as these. Are people finding vintage baseballs at garage sales and cleaning/polishing them? Or are the balls fake as well? From my experience as a memorabilia dealer in the 1980s and early 1990s, 50+ year old baseballs in lilly-white condition simply don’t exist. Note the third ball above – the last picture – has other signatures on it (Stan Musial) that sure look to me to be 1980s vintage, not 1950s vintage. I haven’t seen that color ball-point pen of the Musial signature on balls from 1956. And, look at the dirt around the laces – was the ball cleaned or altered? This ball isn’t even a good fake in my opinion. 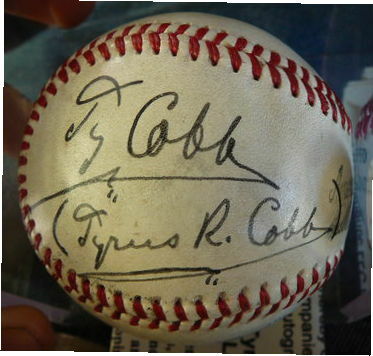 Also interesting that the three Cobb signatures on these balls look nothing like each other – am I wrong? Nice find Max. Thanks for sharing. That picture of Simmons would have been a pretty good choice for the cover of Stump’s bio. So depressing….would love a Cobb signed ball, just cant trust a single thing…. All of those Cobb balls look suspect to me. I like how the one photo is made out to “Jules”. Nice touch. No one would ever guess a n inscription to a Jules would be a fake. It appears that University Archives has removed the Cobb/Simmons photo from its website. Peter thanks for site and the update,having dealt with a few mentioned that’s posted on your site in the past 1990’s-2012.I will be returning around this Ty issue later. i think if there is no real proof then the autograph can not be considered authentic and should be destroyed.